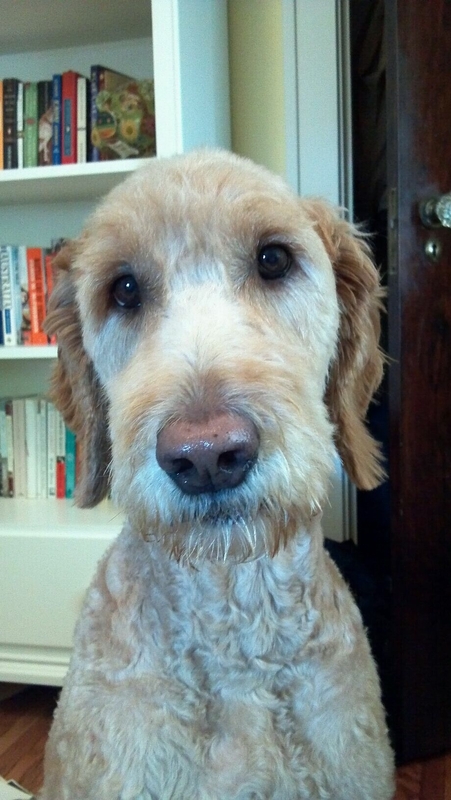 Loveable Henry shorn for the summer to beat the Minnesota heat. 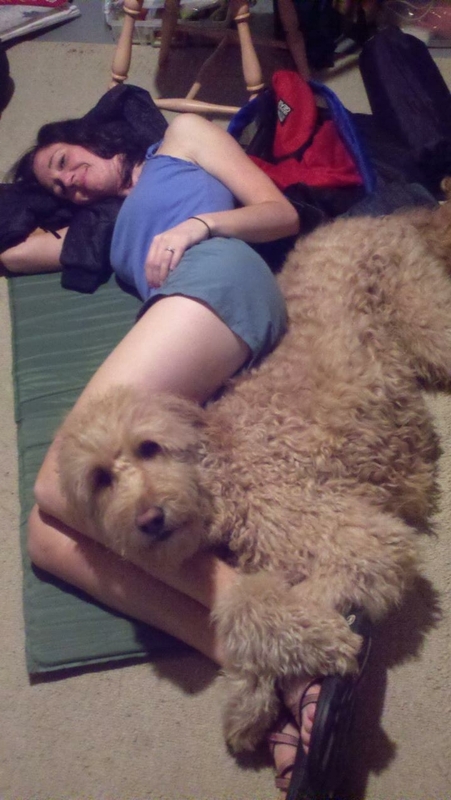 He is just one hell of a dog and a great addition to Ellen and Tim's household. Well, now, I just hung up the phone from a brief but highly pleasant talk with my friends Jane and Dave. That in our conversation Dave would reference items from letters posted here as well as the letters sent expressly to them is impressive (at least to me). Maybe there is some power to the pen after all. Alas, they can’t make it to Wyoming in a few weeks, but it’s still good to connect. That seems to be happening with more frequency, and that’s good, too. Jane: Miss Manners and the other correctness mavens would be aghast that it has taken me this long to send you the proper ‘thank you’ after your swell party last month. It was a really a great time with a great group of people. It was wonderful to see everyone after all these years. It makes me believe I am the only one who has aged, but unfortunately not in the same vein as fine wine. And to think that I thought only women in the South went around barefoot and wearing aprons. You’d fit right in down in these parts. How the hell you managed to pull all that yummy food together and keep your wits about you is beyond me. And that your kids were around to help you and Dave is doubly impressive. They’re a good pair. Really, the funniest part of the whole trip was you and your girlfriends passing notes up in the balcony at Plymouth. That was just a riot. Dave had mentioned that such a hyper-social atmosphere might occur, and he was spot on. We’ll have to start post-sermon tests to see what learnings were actually absorbed by your upper floor crew. It was interesting to re-visit Plymouth after attending my small mixed-race Presbyterian church here in Charlotte. Saw lots of familiar faces in the pews on the first floor. I’m appreciative that you would take the time to pull out all the stops to welcome me back to DSM. I miss the old sod and the people. Yeah, my stake is driven a little further into the ground the longer I’m down this way, but a big chunk of me remains in Iowa. I’m sorry to be so far away from you guys and all the others. Now, this is a bold-faced recruitment effort to entice you and Dave (and the kids, if they’ll go) to get up to the Bridger Wilderness with us on Sunday, July 24. That’s the day we head into the back country for 3-4 nights (depending on what the group will bear). We’ve got a good crew of six coming from Charlotte (including my minister, a great guy, and his family), and for most of them it will be their first trip to the real mountains and not those bumps in North Carolina they term to be ‘mountains.’ This will be the pleasure cruise of backpacking trips. It will be far from a forced march although you’ll have to get used to dried pasta and the like, along with any fish that are unlucky enough to be snagged on our hooks. You are more than welcome – very welcomed, indeed – to join this little Western safari. You’ll have to keep me abreast of the guys weekend whenever it is this fall. My calendar is typically wide open and at any rate will push aside whatever else would show up on the docket to make room for the boys. But thanks again for your hospitality. It makes me wonder just how often you can keep raising the bar. 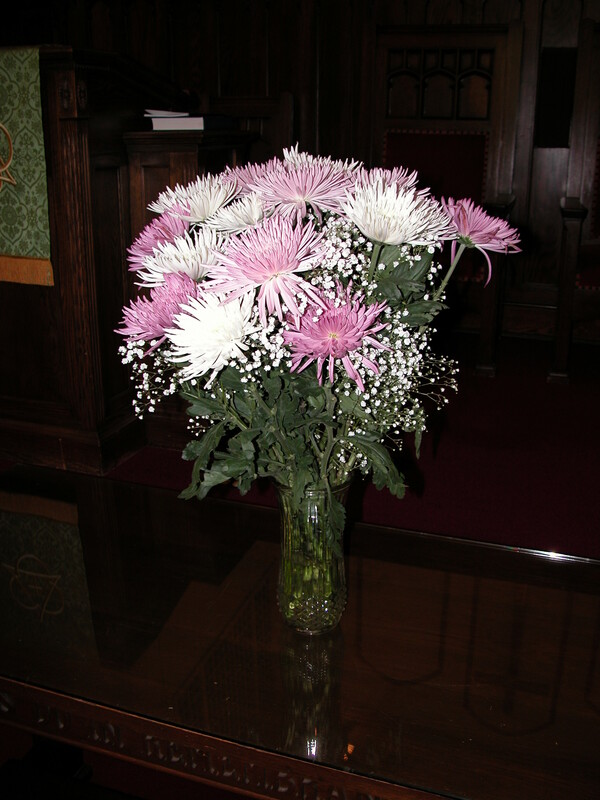 We bought some flowers for Caldwell's Sunday service. Felicia made the arrangement look pretty. It was a nice way to honor dad. This week it will be a year since my dad passed away. As is the case with fathers (and moms, too, most likely), you wonder why you didn’t listen to them more. And then when you’re ready to be all ears, they’re gone. Still, the thoughts are good. So are the memories. Ellen/Reid: Felicitations. I hope this finds both of you well. What’s not to like about summer in those parts other than heat, mosquitoes and humidity? Same thing down here, but here you toss in snakes and other critters. This time next week we’ll observe one year since your grandfather’s passing. I’ve been thinking of him quite a bit lately and it’s hard to believe (like your and Tim’s two year anniversary, Ellen) that it’s really been a year. That whole blitz of worry and travel and arrangements last spring and summer seems like so long ago. My PC screensaver is still the shot of him hoisting a frosty MGD just a couple of weeks before he died. Even the few sips of a cold one he managed to get down brought some joy to him. I’ll probably replace the screensaver sometime soon with a shot of your grandmother but will keep that photo of him handy for those moments when I wish he was still here which is more often than you think. I replay the final day and hours not as often today as I did those months ago and it occurs to me now that he passed with some solace knowing that his family was pretty much in order, his wife was being cared for, his own kids had grown and were relatively responsible, and he had four grandkids that have more than exceeded his expectations. There wasn’t any unfinished business on that score and given the amount he talked about you guys and Andy and Joe those last few days he could for the most part just let things go. At the time the hospice lady kept telling us to remind him of those very things as a way for him to ease his own passing. How they know that he could hear and process what we told him is beyond my meager comprehension. But that was good enough for me at the time and was probably as it should be for him. Next time I’m in the Midwest I plan to stop by to pay the old boy a visit. Nothing new out West. Ellen, grandma certainly appreciated your call. She sounds pretty good, all things considered. And thanks, too, for your Father’s Day calls. Those were nice to get. Route to me a few more photos now and again so I can see visually what’s going on in your worlds. I giggle every time a shot comes through of Henry. If there is a more contented dog who knows his place in the scheme of things, I don’t know where that dog would be. In a month we’ll be in Wyoming. Really starting to get gizzed about it. Ellen, please don’t fret over your plans to join us. No biggie at all. Your summer is full enough with a kitchen and just rejuvenating from the school year. People are nervous about the nighttime temperatures up high but it will be what it will be. Hope for the best and plan for the worst. I’ve been climbing aboard the elliptical machine for 20 minutes or more and every day brings a little more improvement. Just have to keep at it. I’m not so lucky when it comes to those arm exercises where you push yourself away from the table. That’s not working out so well. Well listen, I’ve got to run, literally and figuratively. Again, keep those calls and photos coming, and maybe, hopefully, we’ll all get together under fun circumstances sometime soon. Politics don’t do much for me. I’m not cut from that cloth and am not active in any way at any level. No rallies, no door knocking, no phone canvassing, no volunteering. My opinions are largely my own (which is probably a good thing). I’ve only written one letter to the editor(http://www.charlotteobserver.com/2010/09/01/1658443/parents-should-cut-the-string.html) and it had no political overtones at all. But I’m about to write one that does. The only thing is, the Charlotte Observer (if it’s still around) will need to wait a few years to publish it because the paper would be cc’d on the note below. North Carolina has one-upped itself in terms of being a state of short-sighted nitwits. Granted, the economy continues to struggle, yet our legislature has turned back the clock by shoving North Carolina into the upper 40s in terms of per-student education spending. The budget has largely done away with early childhood education plus other deep cuts that deny public education’s role in forming kids into ready-to-go workers and an educated populace. The problem is, the extent of the damage really won’t be known for a decade or more. Fast forward to the year 2022. Let’s say I ran a successful business that would move to or expand its sizeable operations in North Carolina. My due diligence would weigh North Carolina’s business environment in a number of ways, including the size and extent of an educated workforce. Assume, too, that the governor and other business-types were cozying up to my firm in the days leading up to my decision. This year’s actions – or non-actions – would kick in right about then. I greatly appreciate the time and attention you gave our company as we explored our options to grow our business. There is much to like about North Carolina; a favorable business climate, ready access to transportation, a physically attractive state, and yes, your moderate weather. All of those factors, and some others too, weighed in your favor. As you know, we asked about (and explored on our own) the scope and availability of the qualified work force we will need to help our business succeed. Your assurances aside, we are not convinced that such a work force exists today in North Carolina. We disagree that your unemployment rate signals sufficient numbers of a ready-to-be-tapped labor pool. On the contrary, it is a labor pool that from our perspective lacks the prerequisite skills we need in quantity, particularly entry-level positions. Not that we do not train our workers – indeed, we take great efforts to do so – but we expect any candidates to come to us with the fundamentals already in place so we can mold them into the productive work force we need. We are troubled by your state’s low rank in per-pupil education funding. My business takes the long term view that whomever we hire must come to us with sets of skills they have already been taught that we cannot be expected to teach. At any of our locations, we depend on a steady flow of qualified workers year after year after year. We have decided to pursue other options for our business operations. We appreciate your attentiveness to our questions about incentives and favorable business climate, but in the absence of what we perceive to be a readily available, skilled and educated work force, we cannot stake the future of our enterprise on a state that cannot assure us of a continuous supply of qualified workers we need. Ellen is a teacher and my dad finished his career as an educational administrator, so the education gene runs in the family, or at least those two. Even Reid has his moments about graduate school. The chance of the gene skipping me is a foregone conclusion. I try to be supportive of Ellen in her efforts but it’s a struggle these days for teachers. A preoccupation with testing, lack of materials and a lack of parental involvement (an old story) make teaching tiresome. Even in education supportive Minnesota, there’s an assault on schools but largely for budget reasons. Yet the attack is nowhere near as overt as it is here in North Carolina. It not only stems from our woeful budget situation, but it is a philosophy of politicians that teaching kids is not the highest priority. For some reason, they don’t tie the three R’s to job creation/growth, an educated citizenry and a better society. But Ellen knows I’m in her corner and that of teachers. And kids, too. Ellen/Reid: If you want to know how stinky hot it is down here, re-read the first paragraph of last week’s letter. Nothing has changed. It is still oppressively hot. Reid, you had to get slammed with the same weather when you were in Tennessee for Bonaroo (sp?). Better you than me. I can’t even imagine it, plus I can’t imagine the clean up either. How you slog through days on end of camping in the muck with 80,000 other concert goers is quite a tale, and I’m sure there are tales. You’ll have to tell me about it. How many years of this has it been for you? At least three or four that I’m aware of. Ellen, glad you’re footloose for the rest of the summer. Unwind, unwind, unwind. Although the kitchen project is going to be a joint test of patience and resolve; i.e. ‘I resolve to not let it get under my skin’. Nothing ever goes easy/smooth/on time with that kind of massive gutting an re-assembly of a kitchen. Just get up in the morning, trundle over to the coffee shop with Henry in tow (or him towing you) and get a good mocha-latte-lite roast-non-fat maci-something or other that you get. That’s the best plan. I hope you will make the jaunt to the Bridger to join us. That would be fabulous. You, too, Reid. The ticket is on me. Into the back country on July 28 and a retreat to the cushy world on July 28. I bought a new MSR stove (I will pay handsomely if either of you know where the old MSR stove is) and other gadgets for the trip. My goal is to pack as light as I can. Ellen, at one time I had the dream that maybe one day you’d come down this way to shown ‘em how teaching ought to be done but now I’m glad you didn’t pull up stakes from Minnesota. CLT just lost the superintendent that people were very split on; he was a big “tester” and some folks thought that drove teachers to teach for scores rather than for teaching. I tend to agree with that. He got out when the getting was good. Our legislature, in its GOP wisdom and under the guise of a sour economy, has essentially gutted public education and cut out a raft of things that were simply good for kids, notably early childhood education. In these parts they just don’t value a good public education which is ironic because that is what brought the South up. Here, only the “haves” have the means of sending their kids to tony private schools where the tuition is more than most state universities. Our legislature doesn’t view education as a way to create good people, give the potential labor force good work skills, keep them off the streets, or foster job growth. None of that. I’m not sure how they look at it. They are very anti-teacher, probably in part because teachers have their state version of the NEA. Your grandfather is probably rolling in his grave at the thought of yahoos disassembling the engine of forward movement for people. It’s a travesty. You can bet your bottom dollar if it involved guns or other redneck priorities, they’d embrace it. But they don’t. It’s really the one thing that galls me about both Carolinas; they just don’t want to educate people beyond this inane desire to test kids as the one barometer of showing progress. No Child Left Behind is a misnomer because they’re all going to be left behind. Well, I’d best sign off and get back to it. I am always available by phone (Reid) so don’t be strangers. Stay cool, relax, and get on with things. I was about to hit the sack last night – please, don’t embarrass me by asking what time – when the phone jangled. It was Reid. After weeks off the family radar, the lad finally surfaced. For 30 minutes he opined and dad listened. The big news was a trip to a music festival in Tennessee called Bonnaroo. He and a group of friends, four guys and seven girls (I can do that math), rented an RV in Dallas and drove to TN to sweat and groove. It’s at this point that dads should turn a blind eye to whatever the hell else goes on. But during our golden half hour, Reid dropped in random items that he had no other way of knowing about other than the weekly letters. Not that he’s not done that before, but after several weeks of not talking to each other – hey, the kid lives his own life – it was validation that conversations aren’t limited to phone calls. Some weeks its just hard to find something to pontificate on in the fatherly sense. It could be accurately chalked up to a lack of strong coffee or that nothing reveals itself at the moment of creative conception. I am ramping up on red-red-red North Carolina politics that set our state back, our shunning of environmental issues and the like but nothing has jelled as of yet. So I fall back on my PB days (the Pre-Betsy admonition to write something of depth so as to be of interest to her that in tandem would show my personality to the kids) and thus a letter becomes a compendium of the small things that went on the week before. Last weeks letter was a definite throwback to the PB days. Ellen/Reid: Well, if you like heat and humidity this is the place for you. Blast furnace hot but damp at the same time. Go figure. Here’s the update on Felicia. Her surgery is set for the end of this month. That nearly 30 day delay would absolutely drive me more bonkers than I already am. Why in the world they wait that long on such a terrible disease is totally unfathomable to me. I lectured her this weekend, more than once, to call her physician’s office this morning to see if she can light a fire under the operating doctor so we’ll see if that does any good. There was a related article this morning in the paper about some new drugs specific to melanoma. Advances, yes, but not a cure. This comes at a time when she’s wrestling with other issues in her life, notably her son who has veered onto another path she’d rather he not take. I don’t know. I’m glad you guys are who you are, but it is very hard to see her have to endure another bout of the same situation she has already endured for years. I’d rather that she take the time to tend to herself but the mother’s instinct to nurture, or at least care for, her offspring is awfully strong. She needs to worry about herself for a change. I plan to be with her at the surgery and be available for whatever else she needs between now and then. Ellen, I’ll need to tap into your teaching expertise in the next couple of weeks. My class on freelance writing is filling up at the local community college (it will probably top out at about a dozen or 16 students) and I’m starting to get nervous about it. It’s not the content that is vexing but the presentation of things. The class will be in a high-tech lab setting loaded with capabilities for PowerPoints and other sort of splashy gizmos. My class outline is done but that’s all it is; an outline. I’ll head over to the college later this week to familiarize myself with the ins and outs of the learning laboratory. They say to teach is to learn twice so maybe that’s good. All in all, this probably is something of an odd time for freelancers. The pay scale has dropped like a stone (at least in the newspaper biz) but the availability of work is probably pretty good in that in this economy firms may not keep full time staff but instead farm the work out depending on their situational needs. Your uncle lifted his cell phone to your grandmother’s ear this weekend but I couldn’t understand much of what she said beyond “I love you, too.” I just don’t know what to make of it. I wish I could be there a lot more often. Her health seems to have stabilized for the time being. I’m dependent on your uncle’s reportage of what’s going on and he’s around her often enough he sees the ebb and flow to her situation but he’s not sounding any alarms as of late. It looks as if Joe is going to buy your grandparent’s house. I have some mixed feelings about it, largely because he’s being influenced by your aunt and uncle (the house design is a bit staid by young person’s standards, I would think). He’ll get a sweetheart deal on the house but I suppose when you do the math in terms of what it might sell for minus the real estate agent’s commission it’s probably not that bad an overly bad thing. Joe and Ally will have their baby at the end of this month. Ralph and Gayle are pretty excited about it. Their third grandchild. Guys, I’m in no rush. That’s about it for this installment. Working out for Wyoming (there’s a long way to go physically) and just trying to keep cool in this oppressive heat. Reid, the offer of a ticket to CLT still stands, and Ellen, watch for news about a trip up to see your swanky new kitchen. The pix of the gutted interior are cool, but for your sake I hope the contractors get a move on so you don’t have to live in a pile of dust and debris all summer. An end-of-June timetable seems nice. I hope they can live up to those terms. I am a habitual offender when it comes to one of my friend Betsy’s cardinal rules: send thank you notes. Guilty as charged. In the spirit of turning over a new leaf, I finally got around to writing my hosts, Stacey and Bruce, who allowed me to stay in their home during my May trip to Des Moines. As lateness goes, maybe it was still in the 30 day grace period (if such a thing exists) for such niceties. But if nothing else, it gives me latitude to add Stacey and Bruce to the ever-expanding circle of folks I can write to. Stacey and Bruce: I’ve let a month slip by without sending you guys a proper thank you for allowing me to crash at your home and come and go as I pleased for more nights than should be allowed. But it sure beat the alternative which would have been some motel on the outskirts of town. It was a real treat to stay there. It is remarkable to see how Jack has grown, and I can only imagine how Max and Alex have matured. Are they getting older or is it just me? One in China, the other in Philadelphia? It just doesn’t seem possible. The next thing you know they’ll be married and you’ll be grandparents, although let’s not get too far ahead of ourselves. One way to look at it is you have enough room to accommodate a visiting brood. It was great being back in DSM for even a long weekend. I was telling Jane Hemminger that I miss the old sod and the people there and there’s a lot of truth in that. When you look at all the factors, Des Moines isn’t faring too badly vis a vis some of the cities down this way. Real estate is holding its own, the schools are still good, unemployment is in single digits, commute times are manageable. None of which you can say about North Carolina, let alone South Carolina. It adds up to a pretty nice picture. I was really impressed with how things have pulled together in the downtown. Charlotte should send a contingent up North to see how it’s done. When I moved here the city was living the high life in all respects, but when things crashed we went down very hard face first. I sense that Ellen is on a mommy-track. All of her friends have little ones and I get the suspicion – she’s never mentioned anything to me so my view may be unfounded – that she’ll join them before long. She seems to be nesting a bit in that they have gutted the kitchen in their older home in St. Paul for a total makeover. The tear-out is complete but the work has yet to begin and she is still of the Pollyannaish view that it will be completed by the end of June. Dream on, kid. I’m hopeful of getting up there before long to view the work-in-progress although I perceive that they just want me to walk their dog and do their yard work for them. That would be okay. Reid is another matter all together. He has gone incommunicado for another long stretch. When he surfaces will be anyone’s guess. I think he’s just getting on with things which I suppose is what boys will do. We’re on a need to know basis and apparently we don’t need to know. He likes his new agency and his neighborhood, but that was as of three weeks ago so who knows if the landscape has changed. Well, gotta run. But thanks again for letting me intrude for nights on end. It was great to see both of you, and if by chance you ever get down to the Carolinas, you have a place to crash, too, although my guest room is Spartan by your standards. See you soon.